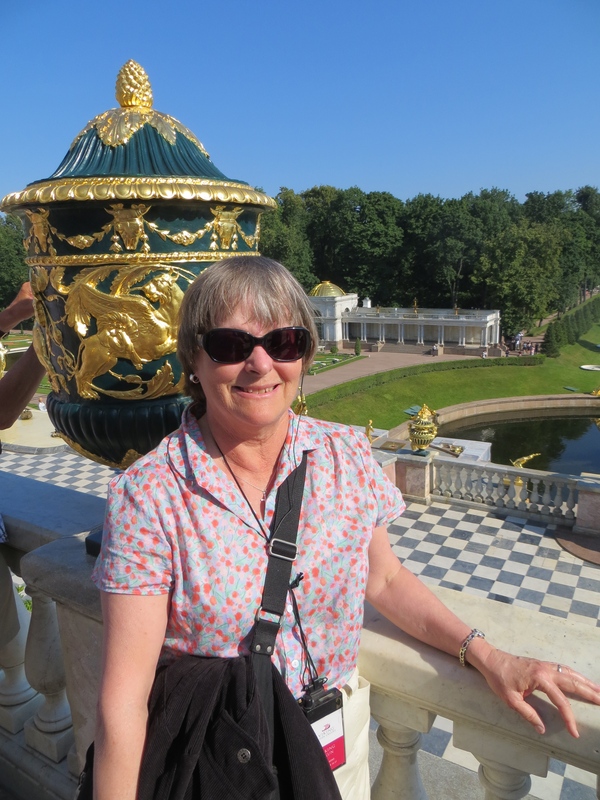 We boarded our bus promptly at 8 and headed out of the city to Tsarskoe Selo commonly known as Catherine’s Palace. We were greater by bands playing the Star-Spangled Banner. They knew who they were playing to but were not in line with the state controlled media. It was OK since they were playing for tips. We arrived at opening time and the tour was much better than that of the Winter Palace. We were free to take pictures except in the Amber Room. The entire structure was ravaged by the Nazis who occupied it during the 900 day siege of Leningrad. Besides looting the famous Amber Room and whatever else they could carry away, the Germans left booby trapped bombs that fortunately were not exploded. Stalin was less than enthusiastic about a restoration but it happened anyway and is a masterpiece of such an effort. I am reminded of the Allied destruction of Monte Cassino but the difference was that there was no military reason for the damage to this palace other than German nastiness. The palace owes its origins again to Peter’s daughter Tsarina Elizabeth who had the place built at the same time as the Winter Palace. The architectural elements are of the same era as are the additions by Catherine the Great. Elizabeth prefers the Baroque and Rococo the Classicism preferred by Catherine. Catherine had the Scot Charles Cameron design her a summer pavilion that was attached to the main palace. It served a similar purpose to Hermitage as the location for private parties. We did not venture inside this structure but my imagination filled in some of the details. The facade of the building is some 300 meters or three football fields long. Mercifully we toured only the key parts of the structure. The Great Staircase was similar in design to that of the Winter Palace. The Great Hall impressed even me with its mirrors and gold leaf to rival Versailles. The scale, while massive, was strangely more livable than the Winter Palace. The displays of dinner place settings in the classical Green Room made me wonder where were the dishwashers were located. Nothing like 2000 pieces of silverware, crystal and porcelain to satisfy 20 guests at an Imperial meal. The only place we were forbidden to take pictures was the restored Amber Room. Only a small section of the room was recovered from the Nazis. Most of the room was restored using extant photographs and drawings. The use of Amber is stunning although definitely not to my personal taste. I did manage a couple of somewhat illicit photos from outside the room. The purpose of the restriction was to sell picture books as Amber is surely as resistant to non-flash photography as porcelain. We headed out to the British and French Gardens. The ponds and naturalistic settings of the British tradition in the back yard were easier on the eyes that the formal French design in the front. Several structures were created to enhance the design and create the British Picturesque look. I believe I enjoyed the gardens as much as the interior. We returned to the ship by noon and had lunch before leaving for a bus tour of downtown St. Petersburg. We opted out of the subway walking tour because I wanted to see the Peter and Paul Fortress. It was the first time for our local guide and he was a bit rough but sincere. Our first stop was at the Smolnyy Convent that also was built by Elzabeth I. It s original purpose was to be a place for Elizabeth to become a nun in a nice place. She changed her mind and decided that it was better to be the Empress. The whole complex never saw a resident nun but became a school for the daughter’s of Russian nobility or a Wellesley on the Neva. We walked around the church without much narration and were left to fill in the blanks by ourselves. It is interesting that Lenin directed the October Revolution from an office in the girl’s school and the same Institute became the offices of the Leningrad Communist Party. We did some more drive-byes before stopping in front of the St. Issac’s Square to view the massive 19th Century cathedral dedicated to the Old Testament St. Issac. This naming of Old Testament Prophets as a saints is somewhat particular to the western Christian tradition. Nonetheless, this church is one of the largest in Christendom built atop countless wooden piles to support its 336,000 ton weight that includes some 48 massive granite columns that bear the scars of WWII shelling. To the dismay of Peggy, we did not have the time to climb to the top of the gold encrusted dome. We did walk around the equestrian statue dedicated the Tsar Alexander I who presided over the Napoleon’s defeat. He came equipped with a bronze bird on his helmet and effectively pre-empted pigeons. The bus next dropped us off at Arts Square off the Moyka River. While the Neva is the arterial river through the city, the city actually is traversed by a number of rivers and many canals. We walked along the gates of the Russian Museum with its collection of works by Russian artists. It was originally built for a Grand Duke but became a museum in the time of Nicholas II before WWI. Our immediate destination was a walk around the “Church of the Spilled Blood” named after the assassinated Nicholas II. The church was built on the site where Nicholas was blown up by a terrorist bomb. In terms of architectural exuberance, it certainly rivals St. Basil’s in Moscow. We did not have time to go inside but the exterior was overwhelming in its complexity and design. We reached the Peter and Paul Fortress on the other side of the Neva River. After parking and a much needed restroom break, we ventured into the fortress. The massive brick walls were never the recipient of hostile action. Hostilities were reserved for the occupants of its notorious prison. We walked through the main riverside gate and admired the sunbathers who cluster around the sparse beaches and use the massive brick walls as a heat sink to rest their bodies against. The high light of the visit was to the tombs of the Romanov’s. Peter’s time as it is western in plan lacking an iconostasis and having a nave. We returned to the ship with buildings and monuments hurriedly pointed out as we drove past. We managed to get some good pictures of the cruiser Aurora of Bolshevik Revolutionary times. It fired the gun which signaled an assault on the Provisional government holed up in the Winter Palace. I was thoroughly confused by this time as to where we were despite the orienting Neva River. We were not yet through with the day. After dinner we attended an amusing performance by a “Cossack” dance troupe. I have no idea if they were actually Cossack or not. The dancing was enthusiastic vodka provided at intermission was appreciated. Several of the cast members could pass as residents of Big Hill. I thought I saw one of my former neighbors. I fortunately missed audience participation as we were ready for bed.